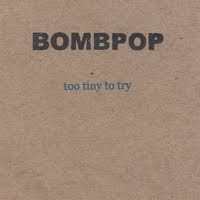 Charlottesville power poppers most recent recording features the hits "Yo La Tengo", "Some Assembly Required", "New Gun for Laurylea" and "Dumps". Okay, so maybe they're not hits, but they're catchy and you can dance to them. Okay, so maybe you can't dance to them, but Tristan really kicks on these versions. CD includes "rough but right" live versions of same tunes recorded at the Outback Lodge that mirror the studio tracks (the lineup was Tristan Puckett, Rick Brown, Jamie Orchard-Hays, Maynard Sipe and Eric Bowers). Listen here to the Farfisa-driven Yo La Tengo (note, they claim this is not about the band Yo La Tengo). Listen to the angular "Some Assembly Required" - one of our favorites. As a bonus, we have dug up the 45-only available version "Bob Stinson" (note, they claim that they wrote this before he passed...and this is indeed the case). It starts with "Wrong Side of the Dial", an answer song to the Replacements' classic. If you were in the DC area in the 90s, you would know of the Graverobbers and stellar tunesmith, Karl Straub. From a rehearsal demo, "Mermaid Radio" is worked into a frothy mix with surfy guitars to match the seafaring lyric. 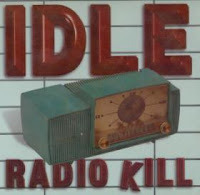 Continuing the Virginia theme, "Radio Kill" is a cover of Brooklyn-based rockers Idle, whose singer, Will Croxton, fronted Harrisonburg's DT and the Shakes in the 80s and early 90s (a band as great as their name). Check out Will's current gig, the Habit. "Radio Cure" is by Wilco - Jeff Tweedy being the poetic sort that he is, "Radio Cure" is the only song on the EP that doesn't seem to be about the radio even though the title sets those expectations. The take on The Replacements' "Left of the Dial" is a sad one, with Vivian's clear vocal augmented by piano, stand up bass and the Coleman Hawkins-esque tenor of the Grandsons' Chris Watling. (Bonus - you can actually make out the lyrics although it remains debatable if these are the right ones). I Like Dinner is Eric Bowers of Bombpop/Grandsons, Vivian Kao of Cowlick Lucy, and Matt Sedgley of the Grandsons. We hope you enjoy them as much as we do. Can you believe it? The Grandsons just became old enough to drink legally and before you know it, they've got offspring - the grandsons jr! They've been playing some shows for youngsters and have been working hard on a record that you and your kids will like! We promise! You may have heard them live and in person - dishing out the Slim Gaillard classics "Potato Chips", "That's Communication" and "Money, Money, Money". We think they've kept that "tune in cheek" sensibility that will appeal to all ages - my aunt! your grandpa! his niece! that girl over there! that cat under there! Under where! HA! We double dog dare you not to love it. Keep posted to here and their website there for up to the dotted half note news! Cowlick Lucy has recorded a stellar collection of tunes called BIG DEAL SO WHAT. It features 9 tunes by Karl Straub, Phillip Stevenson and Paula Jones, and artfully produced by Phillip. Listen to it now at Reverbnation! "Big Deal So What", gently welcoming the listener into a gorgeously rendered song of love. Jonathan Spottiswoode's "That Day Will Never Come" could be the soundtrack to your dreams of love lost. The song's hazy reverb and evocative lyric is followed by the brash cover of Ben Vaughn Combo's "Dressed in Black". In addition to covering songs of friends, acquaintances and favorite rockers, bassist Paula Jones pens and performs songs that cleverly detail the fender benders one finds at the intersection of Women and Men. The record ends with a slyly segued Rumble reference, the reverie is broken. The album is over and is ready to be played again. We thought it would be cool to put some tunes by Whirling House artists right next to the original auteurs (in most cases) - thus the Battle of the Tunes! Vivian has suggested that this is a Family Feud! As you'll see, this isn't much of a battle but more of a tribute. Whateverrrr! it was fun to put together! Bombpop scenester extraordinaire Maynard Sipe wrote this heartbreaker, but the band never finished a studio version. Cowlick Lucy did and put it on "Big Deal So What". Yes, these are the same songs! Bombpop worked up this powerpop version while Yankee Hotel Foxtrot was but a shadowy download, but it was several years before the Dinner folks released this. The Grandsons: That Day Will Never Come available on the wonderful album "Party with the Rich"
Okay, we don't want anyone to vote on this! Left of the Dial is a stone cold classic, and the Dinner folks love it like all of us do - that's why they recorded it as a drum-less ballad with spare piano, standup bass and the Grandsons' Chris Watling on sax. Yikes! 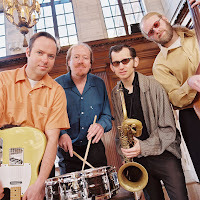 No one compares to the Blasters but the Grandsons contributed a rollicking version of "Blue Shadows" to a Blasters tribute record called "Blastered". "Blue Shadows" was a soundtrack only song found on the 80s film "Streets of Fire: A Rock and Roll Fable". Richmond's most beloved band's most beloved tune - heck, they've recorded and released it twice themselves it's so good. I Like Dinner takes it on...Radio On. He's taken on and faced down aliens, multi-headed canines, multiple personalities and Texas law enforcement, so we don't believe that the Commissioner will want to take Roky on. Plus, we all love Roky and the 13th Floor Elevators, which is why we're posting this cover of I Had to Tell You. We're also excited to hear that the Commissioner is venturing forth from the wilds of Salt Lake to the wilds of San Francisco to record a follow up to his "Churches, Schools, and Liquor Stores" EP. 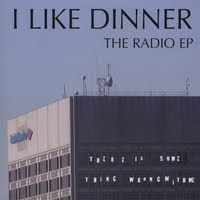 I Like Dinner loved this tune - one of Idle's best but was found only on a 45 (remember those?). Both versions are worth checking out! Clearly, this is no contest. Not up for debate. The greatest band of all time is one of the two. We know that you know and if you don't know, then ask.